When I look through my ever-growing list of recipes, I notice quite a few that are modeled after memorable restaurant meals or frequently used store-bought products. In an effort to save money or control ingredients, readers sometimes ask if I can replicate items that they like to eat. Recent requests are as varied as belVita Breakfast Biscuits and Shake ‘n Bake, and I have my own never-ending list of ideas to tackle. Lots of experimentation goes into creating a copycat recipe, and I enjoy the inherent challenge. For many years, for example, I purchased a bottled Greek vinaigrette that pulled double duty as a flavor-packed salad dressing and marinade for chicken—and my husband particularly enjoyed it. The dressing offered a convenient shortcut with authentic Greek taste, but I stopped buying it when I realized it contained MSG, a flavor enhancer that didn’t sit well with everyone. My original replacement recipe came from a good friend, and I adjusted it over the years, always with that tasty bottled version in mind. The homemade rendition offered classic Greek flavor with a nice amount of tang, yet it was never a clear match. On a recent trip to visit colleges with my older son, we stopped in a Greek restaurant in upstate New York. Their homemade vinaigrette was perfection, and it inspired more trial and error in my own kitchen. When creating a substitute for a store-bought product, the logical first step would be to look at the ingredient list. Perhaps because I started with a friend’s recipe, I never did that…until recently. The label somewhat cryptically listed oil, salt, MSG, natural flavoring, and spices. Between the first two items, however, was the missing link: apple cider vinegar. 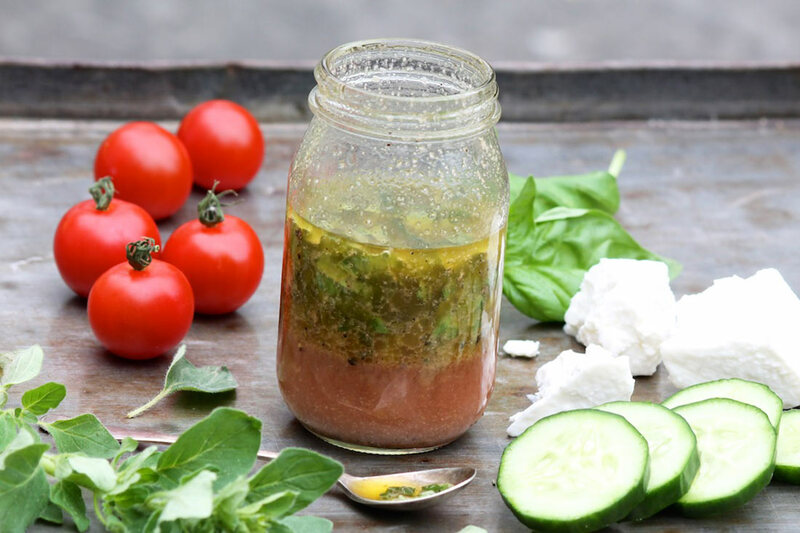 All this time, I had been using red wine vinegar, which is classically Greek and creates a delicious vinaigrette in its own right. But switching the vinegar was the key to reproducing the tender marinated chicken and various salads that my family remembered. To get the most out of this versatile dressing, start with a salad and then let your taste buds wander. 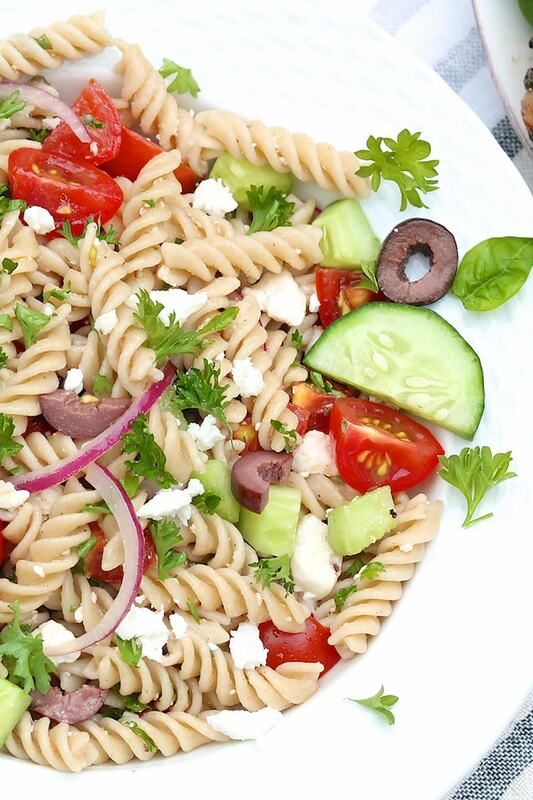 A salad base can absolutely be greens, but pasta, quinoa, rice, and orzo are equally worthy foundations and all take well to traditional Greek ingredients like feta cheese, Kalamata olives, red onion, tomatoes, cucumber, pepperoncini, garbanzo beans, artichokes, tuna, potatoes, and more. With a dressing like this, meals will practically create themselves. For a complementary protein that completes the meal, I often make extra dressing and use a portion of it as a marinade for grilled chicken. For best flavor, marinate the chicken overnight and baste with a little extra while grilling. In a jar with a tight-fitting lid, mix together all of the ingredients, screw the lid on tightly, and give it a good shake. Store in the refrigerator, and shake well before using. The dressing may be used right away, but the flavors will improve once the dressing sits for several hours or overnight. Stored in the refrigerator, the dressing will keep for a week or more. If the olive oil solidifies in the fridge, simply allow the dressing to sit at room temperature for several minutes before shaking and using. *The use of red wine vinegar results in a vinaigrette with more tang. Both options are delicious, just different, although my personal favorite is the version with apple cider vinegar. When using as a marinade: For best flavor, marinate chicken overnight and baste with some of the marinade while grilling. For easy weeknight dinners and casual year-round entertaining, I often make a Greek pasta salad using this dressing. Click HERE for the recipe. 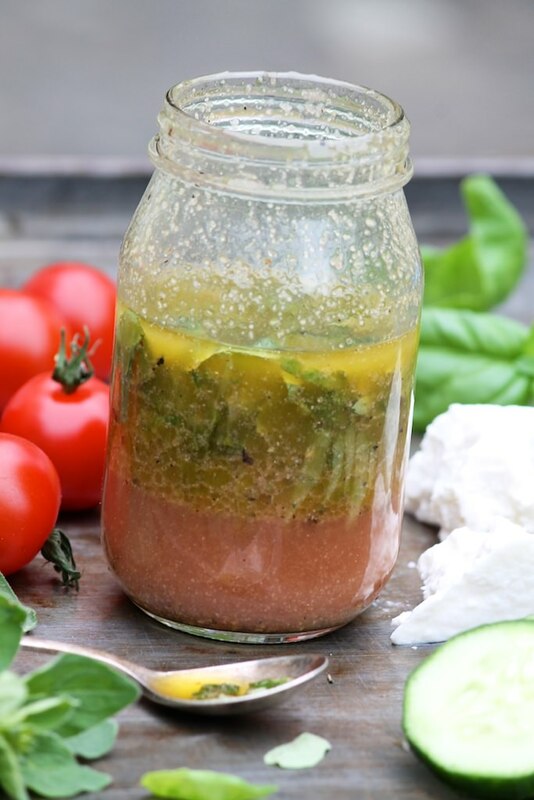 Your Greek salad dressing made with apple cider vinegar is THE BEST!!! Thank you, Ellen! I’m so glad you like! Hi Ann dear! I am going to try this, I LOVE Greek food and am always on the lookout for a new salad dressing to try. I actually want to use as a marinade as well. I can’t believe your son is already going on college visits! It has been 4 years since I discovered your blog, an I am so happy that I did! Made this last night…best Greek salad ever! Using fresh crushed and minced garlic cloves really gives the dressing a bite and a bit of heat. Great recipe. Pork loin chops bone in marinated in this overnight and BBQ’d next day are fantastic. So happy you approve, ChefjohnnyD, and the marinated bone-in chops sound divine!